male gametophyte generation. Each pollen grain contains wing like structures that help it in its journey to find the female gametophyte containing cone, which is much larger than the male cone. Deep inside the female cones, ovules develop into the mature female gametophyte generation that is the fertile egg cells. The male pollen grains travel by wind to the female cones, completely eliminating the need for water, and then the pollen grain completes fertilization fusing with the female egg cell when it is ready. The union of the gametes produces the embryo of the sporophyte generation, and is protected by a tough seed coat within the cone. 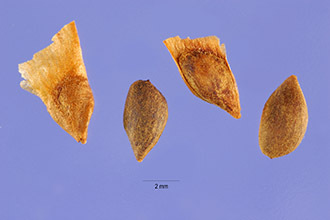 After the cone is approximately three years old, the cone releases the seeds and under ideal conditions, the seed generates the new sprorophyte generation.